The supply of office properties for lease in Orleans Parish has grown over 8.85% annually the last three years, with 1.9 million square feet in 286 properties averaging a lease of four properties per month at $15.62 per square foot. 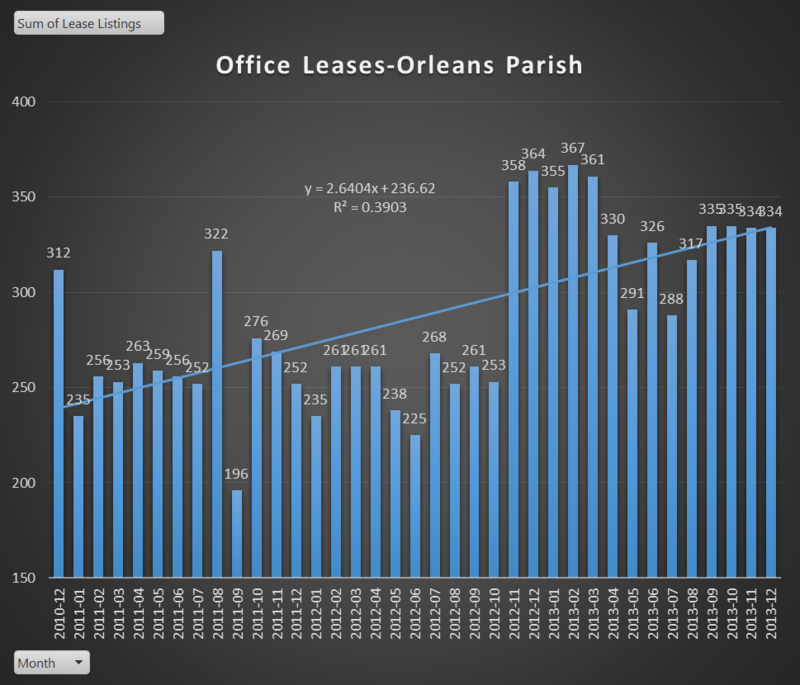 But that doesn’t tell the whole story about the trend of the office market in Orleans Parish. By using pivot tables, we can drill down into the data and determine the real trend. 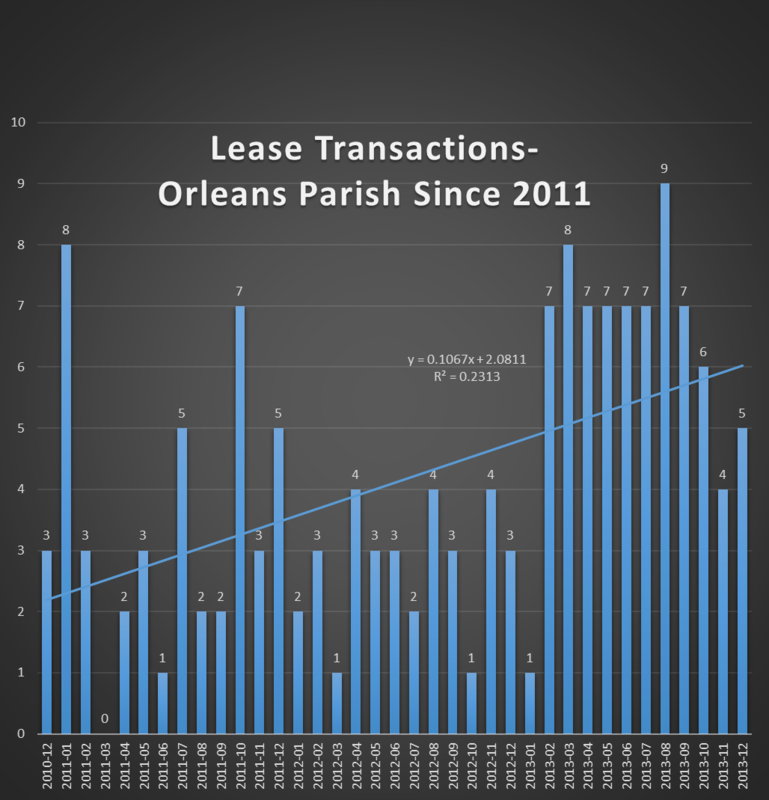 The chart below shows the monthly number of properties available for lease since 2011 in Orleans Parish, with an increase in 2011 of an average of 261 properties to an average of 331 in 2013. The chart below shows the trend in the number of properties leased. Even though the number of properties leased averages around 4 per month, the count skyrocketed in 2013 to 7 per month from around 3 per month in the previous years. 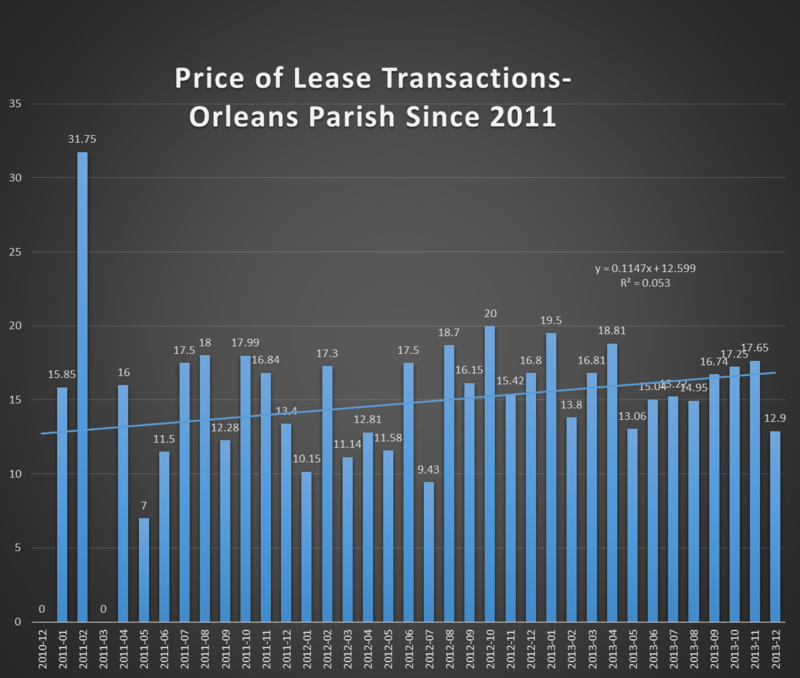 Prices of leased properties in Orleans Parish have risen steadily since 2011. Even though prices average $15.63 per square foot, since 2011 prices per square foot have increased 16.5%, or 5.51% annually, from $13.70/sf in 2011 to $15.97/sf in 2013. Class A-Most prestigious buildings competing for premier office users with rents above average for the area. Buildings have high quality standard finishes, state of the art systems, exceptional accessibility and a definite market presence. Class B-Buildings competing for a wide range of users with rents in the average range for the area. Building finishes are fair to good for the area. Building finishes are fair to good for the area and systems are adequate, but the building does not compete with Class A at the same price. Class C-Buildings competing for tenants requiring functional space at rents below the average for the area. 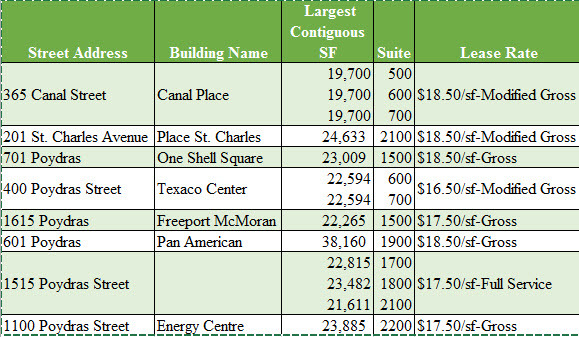 The highest quality office space, and the most expensive, is Class A office tower space in downtown New Orleans, which currently ranges from an asking price of $16.50/sf to $18.50/sf, with up to $30/sf in tenant improvement allowances for long term leases. The table below shows Class A office space for lease exceeding 17,000 square feet, which is usually one complete floor. 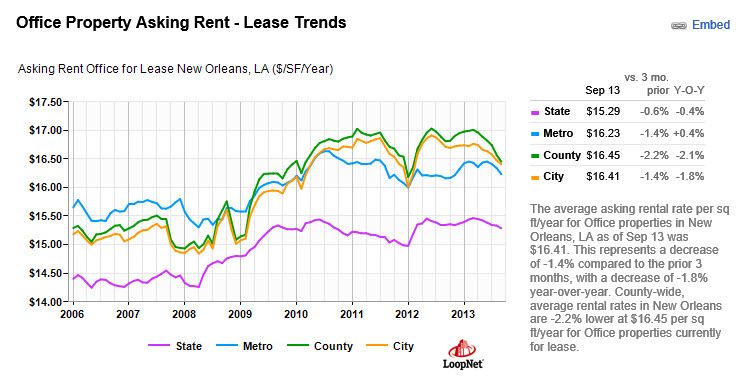 Comparing the lease market in New Orleans, which includes Orleans and Jefferson Parishes, to other markets such as the entire state, the metropolitan area, and Orleans Parish, the chart below shows a decline in prices the last 3 months in all areas, with the state of Louisiana averaging a list price on office space of $15.29/sf and the other areas ranging from $16.23/sf to $16.45/sf.